Ten years of Iker Spozio artwork, LSO St Luke’s photos and setlist, cover versions, Lee Perry tape, and more! Thanks so much to everyone who came to the LSO St Luke’s show in London on 24th May and to Francis Gallagher for these beautiful photos! I really had a brilliant time playing in that amazingly beautiful space! Here’s the setlist of the show, which those of you living in the US and planning to come to the US shows starting on 11 June can have a look at if you feel like knowing what’s in store for you! As you can see, the set now features two cover versions of songs taken from the soundtracks to two films, The Night of the Hunter and The Innocents. If you’re not familiar with the films and the songs, I strongly urge you to watch the films, and in the meantime, if you’re curious as to what the originals sound like, here are two excerpts from Youtube. Speaking of music that I like, here are more things that you can have a look at and listen to. If you’ve read and heard some of my recent interviews, you’ll have noticed I keep mentioning a reggae tape containing mostly Lee Perry productions which my parents bought when I was very little (probably 4, as the compilation’s last selections are from 1979 and I was born in 1976). 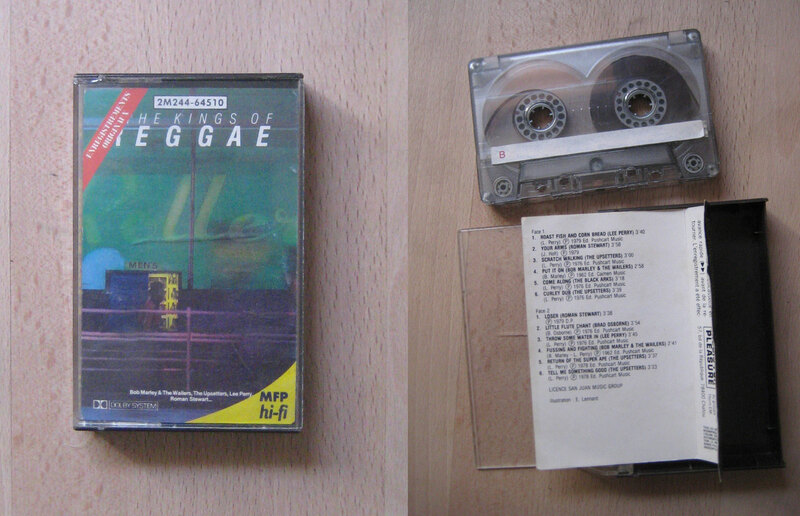 To this day my parents have no recollection of when or where they bought that “Kings of Reggae” tape, my best bet being that they got it at a motorway petrol station and were probably attracted by the Bob Marley mention (they’re definitely no reggae heads! ;-)). In any case, blessed be the day of that purchase, because hearing gems such as “Roast fish and corn bread”, “Return of the super ape”, “Come along” and “Little flute chant” probably had quite an influence on my subsequent development as a musician! American radio programme The Dinner Party Download invited me to select my ideal dinner music for their programme. Finally, in connection with a special concert held at the Barbican in April with music influenced by Terry Riley, I was among the artists to whom the Boiler Room asked what it is about Riley’s music that we like. On the live front, I will be flying to San Francisco on 9th June to start my US tour, I’m very excited indeed to be hitting American shores for the first time since 2008 and I’m very much looking forward to sharing the stage with musicians that I love – you can see the full details on the live page and on my Songkick. I will also be playing my first concert in Brussels since 2007, on August 24th, courtesy of Ancienne Belgique at the Park Royale (free event). You are currently viewing the archives for June, 2015 at colleen.